for your website or homepage! Support up to 100 concurrent users in your room. H.264 HD video with Flash Player 11. 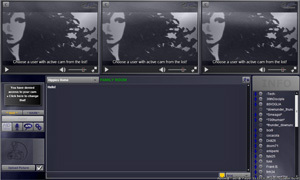 Everyone can view three video streams simultaneously. Server based technology guarantees maximum video bandwidth. No peer to peer! Installation is quick and easy. Have your room up in minutes! You may modify the login form, build your own opener mechanism, or even integrate the chat with your own database, however you must always call the chat through its wrapper page (webcam_window_v4e.php), not download it nor link it directly. We reserve the right to exclude anyone from this service without notice. You are responsible for keeping your rooms content in line with your national laws. All configuration settings are optional! Read below for different solutions. This must be an URL pointing to an image on your server. The image will be scaled to the current chat size, so gradients and patterns work better than actual pictures. An URL pointing to an image to be used as the logo in the corner of the cam video. Recommended width is 50px. An URL pointing to an image to be used as background for the cam video windows. Recommended size is 320x240. Or do it the google way: Camamba Google Gadget. Or for CMS users, there is the Drupal video chat module by JerDiggity of Desynes Web Design, and a Joomla Chat Module. The Wordpress plugin is work in progress, but we think it's already very usable. Or last but not least, your own script. The Camamba chat opens in a seperate window to get most out of a users desktop space. While you are welcome to use an inline frame instead, a popup is recommended. The chatters desired name. Only alphanumeric characters are allowed. The desired language for the chat application. This is a unique ID, which identifies your chat room and must be an existing domain name. If you want to implement multiple rooms, create subdomains. URL to an image to be used as background for the whole chat. The image is scaled to the window size. If this is set, bgImage will be ignored. Instead a gradient based on this color value is used. URL to an image for the cam window background. It is scaled to the base cam size, which is 320x240. URL to a logo used in the cam windows. Width should be 50 pixel, aspect ration is maintained. Base URL for user profiles linked from the user information box. The user's chat name will be attached to it. i.e. "https://www.mysite.com/profile.php?="
The default font color for the user, i.e. FF0000 for red. When supplied, the online URL will be pinged every 30 seconds. You can use this to determine which of your users is in the chat by generating a dynamic URL for each user, when he enteres the chat. I.e. "https://www.mysite.com/onlineTimer.php?userId=12" where the userId parameter is dynamic. To use this, you need a crossdomain.xml file, allowing access from www.camamba.com. All custom implementations must be made in good faith, not to use the chat in ways not intended. It is, for example, not allowed to cut off the ads in an iframe. If in doubt, please ask us. If you want to get serious and would like to install our chat without ads and with the maximum video quality, contact us. The cost is roughly around $1 per maximum user.